I was lucky enough to work on a really varied set of weddings last year, from bright colour pop warehouse ceremonies, to ethereal woodland weddings, pastel blooms in ancient castles to deep burgundy and marsala in Edinburgh city centre. I love that every couple is unique and while there are trends that run through wedding flower preferences, no two bouquets or arrangements are the same. 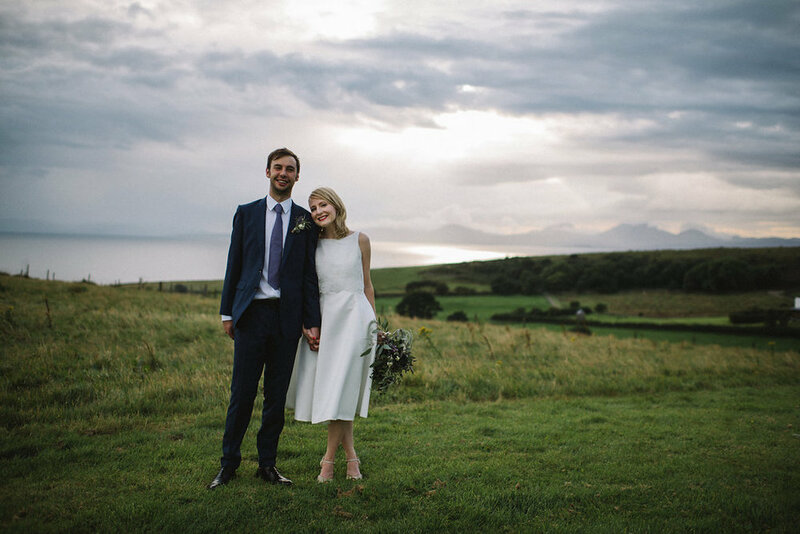 One of my favourite weddings from last year was Fiona and Nial's August nuptials, which took place at the beautiful Crear on the west coast of Scotland. Fiona was initially attracted to my terrariums and dinosaurs with air plants in them, and succulents and tillandsia were soon added to the list of ingredients for her wedding flowers! The muted tones of the Scottish grown flowers were inspired by the colours of the the Scottish landscape. 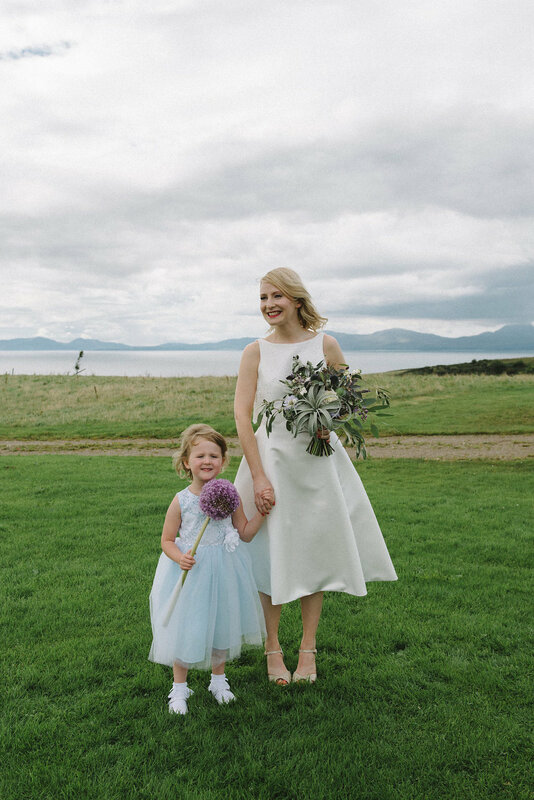 Fiona wanted her bouquet to mirror the tones and textures of the West coast- the sea, sky and mountains. She loved Scandinavian design, clean lines and plants so I used a beautiful tillandsia air-plant as the focus of her bridal bouquet with the unusual lines and colours reminiscent of the sea shore. She could then keep the plant after her wedding as a memento. 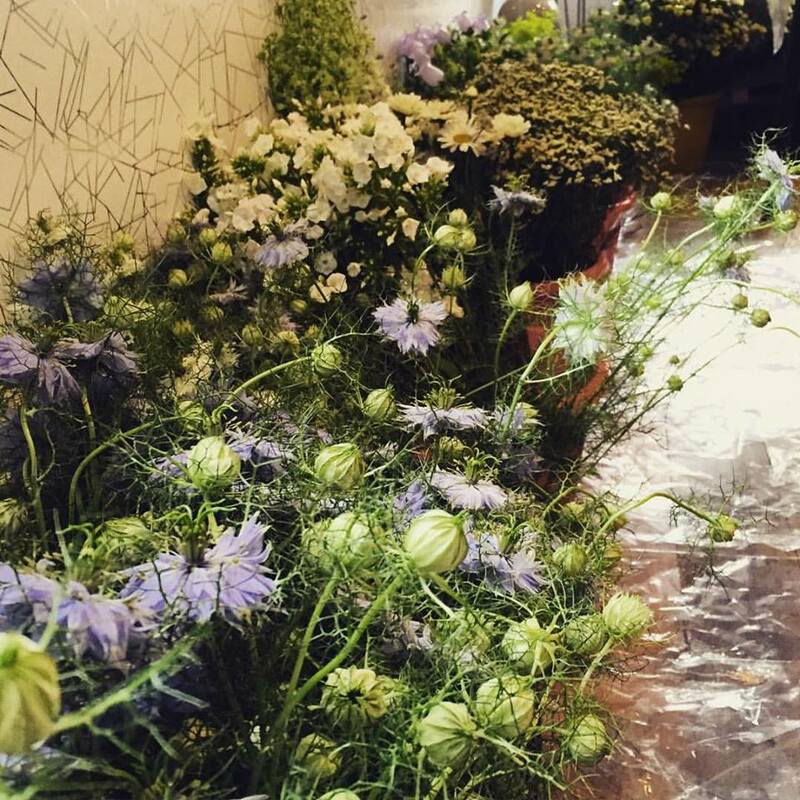 Other ingredients included echinops, lavender, mint, dahlia, nigella (also known as love in a mist) and clematis. Her flower girl carried a giant allium head and I added a small tillandsia plant to Nial's buttonhole to tie in with Fiona's bouquet. For favours Fiona and her mum wrapped mixed succulents in hessian and attached handwritten name tags. I love how the greenery of the foliage, the pale lavender, blue and white tones of the flowers pick out the tones of the landscape and their photographer Lisa Devine has beautifully captured the light and atmosphere of the setting. Before Christmas I ran some wreath making workshops and one of the things that came up in discussion was just how much time it takes to make the designs for a wedding. We spent over two hours making a door wreath but when you have multiple designs to make for a wedding you might not be able to take that much time A lot of people might think that wedding flowers are just done on the day or day before but in fact the process takes many months. A lot of this work is not visible and so when people talk about how expensive wedding flowers are they might not realise all the stages that go on before the bride holds onto her bouquet on the day. Some brides are super organised and will come to me two years ahead of their date with a pinterest board full of ideas and a list of exactly what they want and others leave it to the week before their wedding date and have never really thought about flowers other than what they see in the supermarket. I like to have a consultation with each couple, whether in person, via email or over the phone, to get a good idea of all the details of the wedding, their general style and themes and their personalities. This helps me design their arrangements and pick out the right blooms that will perfectly fit the wedding and the season. Having had a consultation I will go away and spend a long time thinking about the designs, researching what will be in season, what colours will go well together, what elements might suit the couple's personalities and the look of the wedding as a whole. Sometimes this will mean talking to growers or my wholesaler at the market, sometimes I'll visit the venue, sometimes I will put together moodboards and lists of ingredients. Each couple is different in what they need and how much they want to be involved in the process so before you have paid your deposit a lot of creative energy will go into your designs. Throughout the days, weeks, months (and sometimes years) leading up to the wedding date I will continue adding to my mood boards and notes for each wedding when I come across ideas and ingredients that would be perfect for that look. Coming up to the wedding date itself I will have another consultation with the couple either in person, via phone or email to go over all the details and make sure nothing has changed - often it has! Once these details have been ironed out I'll order the flowers - whether from a local grower or from Holland and start preparing the non perishable parts of the order, the vases, boxes and a beautiful wedding card which explains the ingredients of your wedding flowers and their history and folklore. Ordering the flowers itself takes a long time (several hours usually!) and involves a lot of "Flower Maths". If I'm buying from Holland flowers and foliage come in bundles or wraps of anything from 10 -50 stems and I need to work out how many stems I need for each design, allowing for breakages etc, and how many wraps that will translate to. All of this is made more complicated by the shifting price of flowers at auction and I need to be careful to buy materials to the budget agreed with the couple. Different flowers will open at different speeds and need differing amounts of tlc and coaxing to get them ready for your wedding so I will collect the flowers from the grower or market (often these are in different cities altogether) and then condition them, give them a good drink and make them happy so that when it comes to your big day they are all at their most beautiful and full. Sometimes in winter it is hard to coax them out to play, but in summer it can be too hot and they are ready to party far too early! 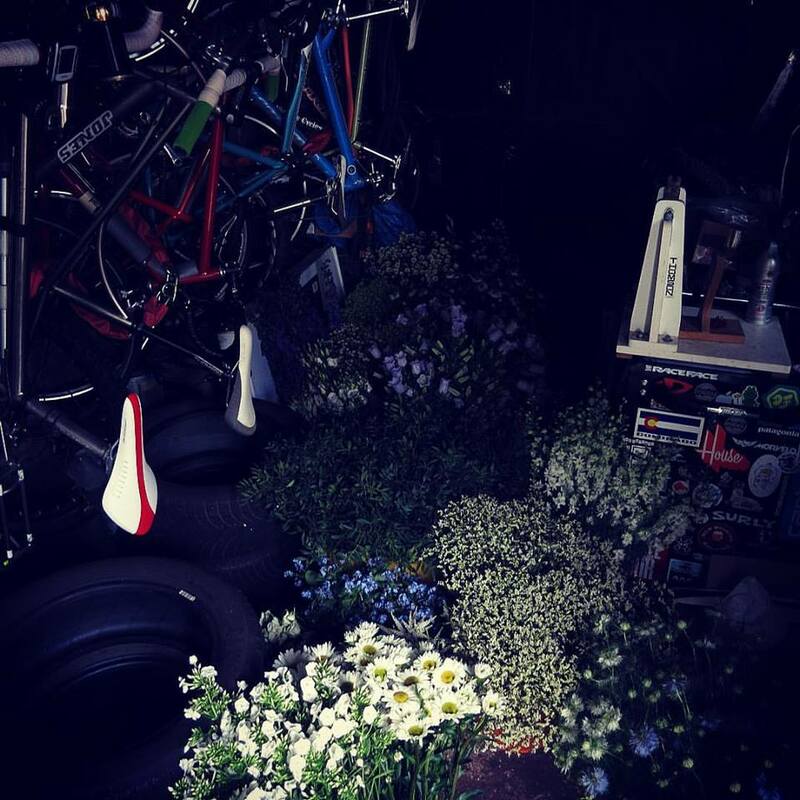 If the flowers are from Holland or further a field they will need a good long drink after their journey across continents and will need to be gentle roused form the suspended animation they have been put in to travel. Now the flowers are ready to work with I will go ahead and start making up the designs in the order that they will last best. This means that things like wired shower bouquets and flower crowns will be done right at the last moment as close to the wedding as possible so that they will last longer. Once a flower is out of water and has been wired up it is on something of a countdown to wilting so I have to bear this in mind when scheduling what designs to make up first. On the morning of the wedding I will get up at a somewhat unholy hour to continue making designs. Sometimes I can hear owls from my studio and once I spent the early morning and dawn in the company of a young sparrow hawk who watched me through the window as I put the finishing touches to the bridal bouquet. I love this time, tired as I am, there is a certain stillness and beauty to the world before everyone else has woken up and the hustle and bustle of the world around me has begun. If I'm lucky I will wolf down a breakfast en route and load up the van before delivering flowers. Often this involves multiple drop off points trying to beat rush hour traffic and the Scottish weather to make sure that each party going to the wedding gets their flowers when they need them. At the venue I'll set up the flowers for the ceremony and reception and make sure everything is perfect before I go. 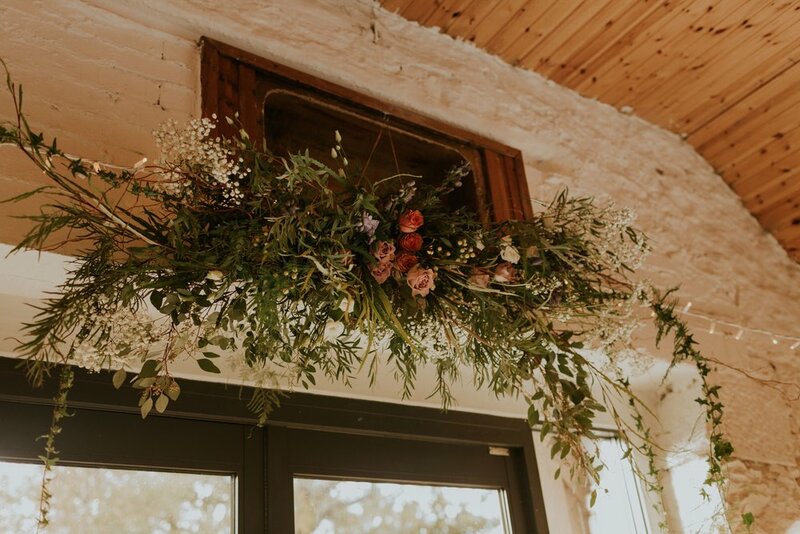 If this includes floral arches and pedestals or hanging designs this is more involved and I may spend several hours at the venue before anyone else arrives making the designs that cannot be pre-made in the workshop or easily transported. When everything is in place and I'm happy I will pack up and slip away before the guests arrive and only the flowers remain, waiting to welcome the couple in all their beauty.